We very much look forward to these delicious pastries and the fun tradition around eating them every year. Children (and sometimes even adults ) love to slide under the table to announce who gets which piece, each person hoping to get the slice with the small porcelain figurine (or “fève”) hidden inside and, of course, then receive the paper crown to be worn! Two crowns are sometimes given so that the…. Arriving from abroad, do you know your child’s grade level equivalent in France? When relocating, choosing the appropriate grade level for your child can be a daunting task. Some helpful tips, along with a chart below, will help you determine the right one. It is important to remember that not only the birth date counts, but also the curriculum when making a grade level calculation. I suggest listening to the advice the school admissions will provide. Cut-off dates are often different from one country to the next and curriculum can vary greatly. In the UK, the cut-off date is…. If you are looking for an apartment or home in Paris, one of the first questions you might hear is, “What type of guarantee can you provide?” Even though your revenue justifies the rent you are willing to pay, landlords often request a form of rental payment guarantee. There are many types of rental payment guarantees available, and the type or work contract you have will determine which guarantee may work for you. The concept of literary accolades in France dates back to the Renaissance period, when numerous poetry contests and improvised verbal jousts took place. These ancient activities gave tempo to the literary and artistic life of its time and eventually became predecessors to the contemporary literary awards we know today. Well-named the “City of Light” or the “Capital of Art,” Paris is an animated, noisy and uncompromising town. When we think about this tremendous city, several images come to mind: a romantic Paris, an artistic Paris, a literary Paris. The best representations of a literary Paris are several famed cafés that have been frequented for decades by many celebrated writers and artists in order to gather, engage in discourse, share ideas and gain inspiration. 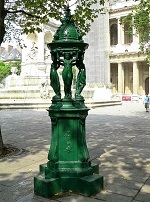 Wallace fountains (“Les Fontaines Wallace”) are drinking fountains made of green cast iron that one can find just about everywhere in Paris. The fountains not only allow everyone a drink of water when needed, but they lend unique and distinguished architectural detail to the landscape of Paris. Just as Wallace fountains or Guimard aedicules help to define the Paris we know and love, Morris columns also form an integral part of this great city’s emblematic and unique urban landscape. Preparing for the final inspection of your rental property is a task not to be taken lightly. This is the all-important moment when you turn the keys to the property back over to your landlord and your responsibility for the property comes to an end. Can You Make a Fire in Your Beautiful Haussmann Fireplace? In historic times, fireplaces served as a principal source of heat in the home. Today, most older Parisian buildings retain their beautiful stone fireplaces, but they are mainly used for decorative purposes.